Is it Possible to Grow Vegetables in a Small Garden? One of the most common questions asked when it comes to gardening is whether it’s possible to have a productive garden when it’s not much bigger than a postage stamp. People are genuinely pleased when they discover it is more than possible. Starting small is also one of the best ways to begin growing your own vegetables, because you’re far less likely to give up. Raised beds are a good idea for those with a small garden. Pots and containers can also be used for growing a variety of vegetables. 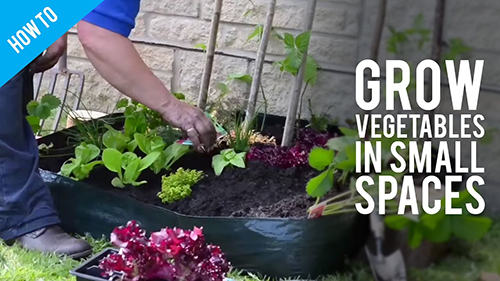 Clearing a space that is bright and sunny or even planting vegetables in a flower border is also another great idea. So what can you grow, and what will provide the best return on the investment of your time and effort? Pick the Crops You Like to Eat – There is very little point in trying to grow tomatoes if you really don’t like them. Pick the Varieties Which are Expensive to Buy – It can be very expensive to buy early potatoes, mangetout and shallots. However, you can grow these yourself and save a few pennies. Pick Vegetables That Keep on Growing – Certain varieties of leafy veg you can keep on harvesting. They are known as cut and come again crops. Beans and peas will also keep producing over quite a long length of time. Try Something a Little Different – You tend to find the most popular vegetables are sold in supermarkets, but there are plenty more varieties available if you want to grow at home. Shallots – One planted bulb will grow into five or six shallots. Garlic – Plant one clove, and it will grow into a whole bulb. Kale – This cut and come again vegetable is available in a range of different colours and types. It is a very attractive addition to a flower border. Purple Sprouting – Another cut and come again variety which can be grown early spring and late winter. Early Potatoes – These are an excellent crop for growing in containers. Mange Tout – A much easier vegetable to grow than peas, and they can be eaten straight off the plant. Lettuce or Salad Leaves – There are a range of different cut and come again salad leaves, rather than cropping the whole plant. Beetroot – Provides two crops in one as you can also eat the leaves. Swiss or Rainbow Chard and Spinach – Three more cut and come again leafy vegetables. Cherry Tomatoes – These can grow in beds, borders or from hanging baskets. Runner Beans – Remember those beans you were encouraged to grow at school on blotting paper? Remember how easy they were to grow? They don’t take up a huge amount of space and will provide a bountiful harvest for many weeks. Herbs – Herbs are very easy to grow outside or why not grow them in window boxes or containers? Garden Club London will be able to help you design a small vegetable garden or help with making flower beds more productive. Are you looking to clean up your landscaping? Contact Landscaping Sarasota FL to avoid any untoward situation. Herbal Dietary Supplements And Its Controversies!! !